As many of you know, I’ve always been a dog person and more recently, I’ve become a cat person too. Still lots to learn about the feline species, but Ninja and I are figuring each other out. You might want to read, A Little Black & White Cat Named Ninja. 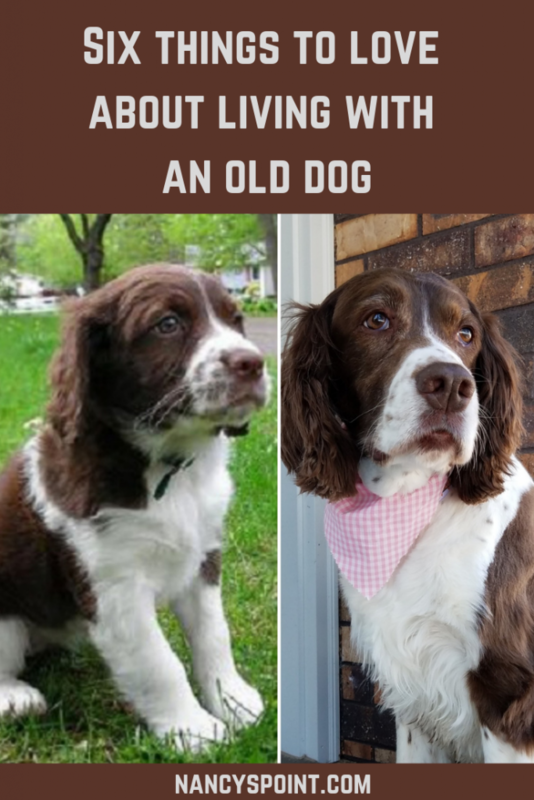 Our English springer spaniel, Sophie, just turned 13. It’s unbelievable to think how quickly those 13 years have gone by, and I suppose me writing this post is in part, the beginning of my preparation for that day that is coming all too soon, but not entirely. I just happen to love old dogs. Other than some arthritis and pretty much total (as far as we can tell) loss of her hearing, Sophie is in good shape, again, as far as we can tell anyway. No one would likely guess her age. (Not sure I can say the same.) But she’s old. Not older. Not getting older. Old. Old Dogs Are the Best Dogs and An Older Dog Is an Extra Special Dog are two posts you might want to read too. 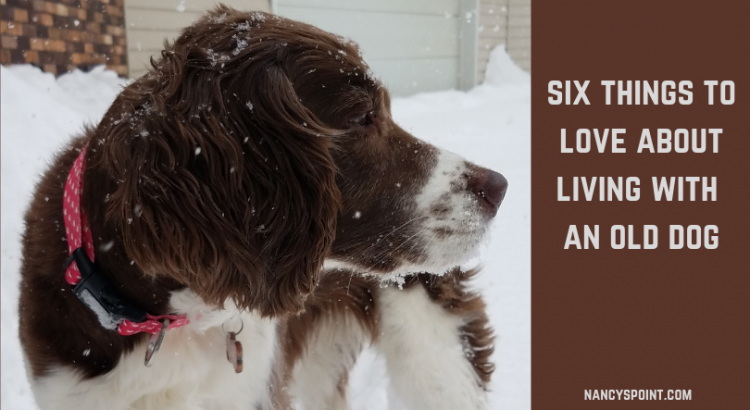 I’ve written quite a few times about the beloved pets in my family, and in this post, I want to share six things I love about living with a dear old dog. I hope you’ll share reasons why you love (or once loved) living with an old dog (or cat) too. As I’ve shared before, my dogs Elsie and Sophie were the only ones with me when I heard the words, you have a cancer. Before that, they brought the special kind of comfort only dear pets can bring when my mother was dying from metastatic breast cancer. More recently, when my dad entered assisted living and then hospice care, Sophie once again rose to the occasions delivering the sort of support only she could deliver. After my parents’ deaths, all the pets in the family delivered more comfort than even my siblings and I thought was possible, each in their own unique way. In addition to helping me through tough times, my pets and I know yours, too, are part of the good times, milestones big and small – birthdays, holiday celebrations, graduations, vacations, weddings, countless walks and all the other day-to-day stuff that makes up life. Sophie’s witnessed it all – the good, the bad and the ugly. Sometimes the very ugly. 2. An old dog’s devotion is unconditional and above all, something to count on. Old dogs offer devotion (and a whole lot more) without asking for much in return. They’ve grown accustomed to our routines, our moods and even our mannerisms. They know us well, and they love us anyway. They never tire of just hanging out with us. Can’t really say the latter about your human family members and friends, no matter how much they love you, right? 3. Old dogs are not as much work. Again, old dogs don’t ask for much. As long as I feed Sophie on time, give her water and let her out a certain number of times a day, she’s pretty content. She’s still very much up for our daily walks, but she’s equally happy to sleep at my feet (or on my bed) while I work at my writing or while I do whatever else I decide needs doing. She goes with the flow. Nice. 4. Old dogs don’t get into trouble, okay, not as much trouble. Puppies are great, but gosh, they are a ton of work. A ton. Anyone who’s had one or has one, knows this to be true. And you don’t have to worry so much about old dogs getting into the trash, shredding stuff up, chewing on the the couch and so on. 5. Old dogs have woven their way into your routines and into your heart. Old dogs are wise dogs. For the most part, they’ve got you and your expectations pretty much figured out. They even have that wise look, that seems to say things like: I get it. I know what you mean. Don’t worry. I missed you. I love you. You’ve both gotten to that stage when you know each other well. It’s a trust thing. Your bond has deepened into something that sometimes surprises even you. 6. Old dogs are the best companions because, well, because they’re old. You can both relax and just enjoy each other’s company. They teach us a thing or two about slowing down. Napping. And just vegging out. The stress of that oftentimes hyper-active puppy-hood is long gone. Don’t get me wrong, puppies are great, and is there anything more adorable than a puppy? I think not. But time spent with an old dog compares with nothing else. So, those are six reasons why I love living with an old dog. What do you love (or what did you love) about living with an old dog (or cat)? Share how your pet(s) help/helped you cope with cancer or just life in general. Sign up for my weekly updates. Keeping it real. Support you can use. OMG, this post showed up in my inbox just as I am grabbling with putting my 13 1/2 year-old lab down. He took a turn for the worse yesterday, completely out of the blue. The impending loss hits on all the other losses, like a game of billiards. I am besotten. You’re spot on about old dogs. Love the photos of yours. Be well my friend. Both of you. It’s hard to put into words how much my old dog meant to me. 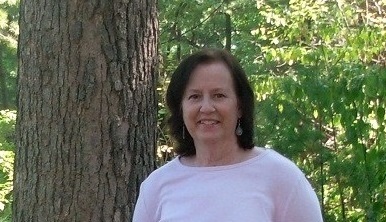 As I was finishing my cancer treatment and fighting for my life, Maggie was coming to the end of hers. She didn’t have much energy by that point, so the two of us were a perfect match for each other. Some days I’d stretch out with her on the ground and we’d just hang out, savouring a sunny spot on the lawn or enjoying the closeness of our bodies as we lay there. Physical touch is so important to our health and being able to reach out and hug her, boosted my mood immeasurably. Based on her deep sighs I’m pretty sure she enjoyed the hugs as well and I like to think that I gave her as much comfort as she gave me. She’s been gone for 3 1/2 years now and I still miss her terribly. I know that when and if I am ready to get another dog, it will be a senior dog from a rescue site. They have so much love and companionship to give and what better way to honour a beloved pet than to adopt another one that needs a home. Our oldest dog lived to be 16. he was a retriever mix, very intelligent. We rescued him from a shelter. I told my son, “Don’t fall in love with the first dog we see!” and then I fell in love. He was fun, he was faithful, and whenever I was upset, or sick, he was there, sitting by me. We all miss him a ton. And I’ve had two cats that I’ve really enjoyed – Ichabod was only 8 when he died of cancer (ironic, no?) and the other is an old lady name Quinn who snuggles up to my husband every night in bed. I’m not really a car person, but they were special. Animals are a wonderful part of life. Linda, Your last sentence says it all, and I couldn’t agree more. I hope someday you decide to get another dog. Sounds like Quinn sleeps comfortably at night! I don’t allow Ninja (our cat) to sleep in the bedroom because she gets up during the night, and I’d never get any sleep! Sophie sleeps in our bathroom. Funny. Thanks for sharing about your pets. Cancer Clunkers: When Words Sting, What Should You Do?